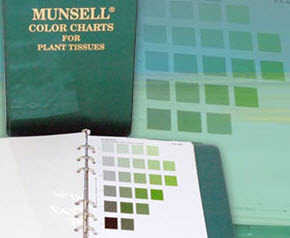 Plant Color Charts Provide a Handy Plant Color Reference for Analyzing Plant Tissue Color. If you’re a botanist or scientist, the 17 plant color charts offer a fast, convenient method for identifying and communicating the color of plant tissues. Plant color charts help you diagnose adverse conditions responsible for the deterioration of plants. Why Use Plant Color Charts? The color of plant tissues reflects the influence of light, critical temperatures, and the chemical composition of the soil, especially when the soil is deficient in certain major or minor nutrient elements. Sometimes plant color reveals the genetic origin of plants, effect of toxic substances, or the action of parasitic organisms. Plant color charts provide scientists, students, and plant growers with information needed to respond to problems related to taxonomy, genetics, physiology, pathology, and plant nutrition. Looking for a specific plant color that’s not listed? Our Custom Color Management solutions can develop the specific color you’re looking for. Contact Munsell Custom Color Services today.